I was sprawled across the sofa watching television when I felt the initial almost barely perceptible shudder. As happens prior to an earthquake striking, one wonders if the sofa rocking ever so slightly is caused by a palpitation or a container truck passing outside. The primal fight-or-flight instinct built into all humans, however, is strong; and my body instantly stiffened as though it knew even before my mind did what was coming. In seconds, as the seismic waves began to roll over the land, the rest of the house began to shake. That primal instinct still in charge, my mind was racing almost unconsciously to calculate the extent of the tremors and if action would be necessary. The shaking must have lasted for at least half a minute; and past experiences ultimately reassured me that action would not be unnecessary. I estimated intensity 3 or 4, the sort of innocuous earthquake one will probably not even notice at daytime outdoors. The time at which the earthquake struck, however, was fairly late; and because most communities have quietened down for the night, a shaking of the house was always going to be perceptible. Typically, the PHIVOLCS web site was unreachable in the immediate aftermath of the quake. I have nothing but praise for the current government in the way it has raised disaster awareness and preparedness among citizens. However, in its haste to do so, it has also failed to realise that government information systems need to be upgraded. The PHIVOLCS web site is not the only one that cannot handle the traffic when it is needed most; i.e. immediately after a reasonable strong earthquake. The PAGASA web site is another one that can be notoriously unreachable just when it is needed most: when there is an impending major typhoon. I know this for a fact because I habitually visit this web site for the day’s weather. People are naturally jittery, and with good reason. All the talk of late has been of the ‘big one.’ This is the magnitude 7 or higher earthquake that geologists expect when the West Valley Fault moves; and that the fault line cuts across urbanised and heavily populated areas is naturally a major concern. The MMDA a few months back even staged these dramatic response drills in anticipation of such a quake; and these were beamed into our living rooms by the evening news. To be fair, the fault is indeed due a major movement. However, geologists say that the fault moves every 200-400 years; or a range of 200 years. This means it can move anytime today or all the way up to 2215. Meanwhile, government needs to realise that corollary to disaster awareness and preparedness is the need to reassure people whenever an earthquake of the scale of last night’s occurs that it is NOT the big one. In other words, the PHIVOLCS and PAGASA web sites should NEVER be down, even if understandably spikes in web traffic are event-driven. While I am all for staging disaster drills, budgeting for these should include funds for upgrading government servers or moving these sites to robust off-shore services that can handle spikes in traffic. To illustrate why, ‘Lipa’ trended last night on Twitter because it was being erroneously pegged by some netizens as the epicentre of the earthquake. This is the sort of confusion that can be avoided if the PHIVOLCS web site can handle spikes in web traffic. Meanwhile, after at least half an hour, the PHIVOLCS web site was finally reachable again. 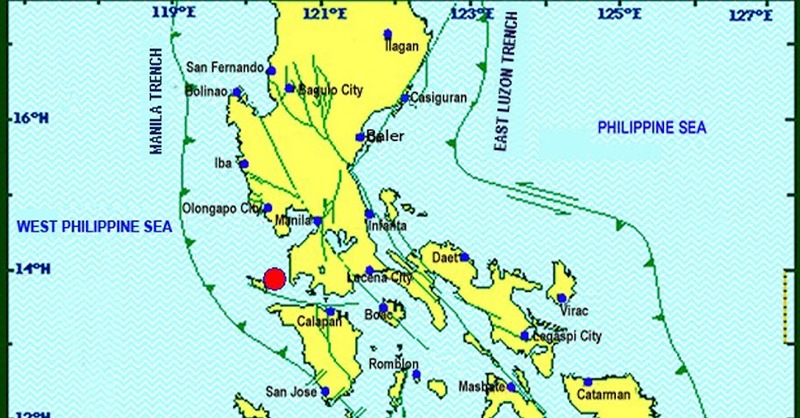 We all finally learned that the epicentre of the magnitude 5.4 quake was east of Looc in Oriental Mindoro. There is actually an active underwater fault line between Batangas and Mindoro and its frequent movements actually cause itty-bitty quakes frequently with epicentres close to the municipalities of Calatagan and Mabini. Last night’s quake occurred at 9:51 PM. At 8:10 in the morning yesterday, there was also a magnitude 2.1 earthquake likely along the same fault but with its epicentre close to the coastal town of Mabini. Meanwhile, last night’s quake was reported to have been intensity 5 in Batangas City. It was reported to be intensity 4 as far north as Muntinglupa, Pasay, Makati and Mandaluyong. Lipa is not mentioned in the PHIVOLCS web site, so the quake must have been between intensity 4 and 5, after all.